Ascent Aerospace, which provides aircraft assembly line integration services, has added Exechon Enterprises’ parallel kinematic robots to its portfolio of manufacturing automation solutions. Exechon’s Parallel Kinematic Machine (PKM) technology offers the stiffness of a machine tool with the dynamic 5-axis capability of an articulated-arm robot, for faster, more accurate assembly and higher overall equipment effectiveness. 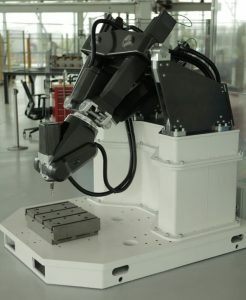 EXECHON XMINI parallel kinematic aerospace robot.